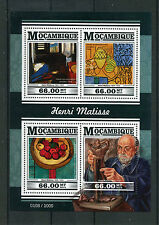 (Mozambique 2015 Henri Matisse (1869-1954) - Mint Never Hinged (MNH). (175.00MT) - Goldfish (detail), 1912. Sheet with 1 value (1v S/S) 3) Select each item and 'Add to Basket'. (66.00MT) - Mont Sainte-Victoire and the Viaduct of the Arc River Valley, 1882-5. Mozambique 2015 Paul Cezanne (1839-1906) - Mint Never Hinged (MNH). (66.00MT) - Mont Sainte-Victoire, c.1895. Sheetlet with 4 values (4v M/S). 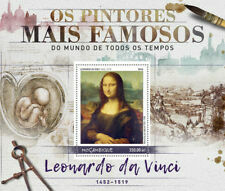 (Mozambique 2016 Leonardo Da Vinci - World Famous Painters - Mint Never Hinged (MNH). Sheet with 1 value (1v S/S): 350.00MT. ==================================================. 3) Select each item and 'Add to Basket'. (Mozambique 2016 Alphonse Mucha - World Famous Painters - Mint Never Hinged (MNH). Sheetlet with 4 values (4v M/S): 100.00MT x 4. 3) Select each item and 'Add to Basket'. Mozambique 2015 Henri Matisse (1869-1954) - Mint Never Hinged (MNH). (66.00MT) - Henri Matisse (1869-1954). (66.00MT) - Interior with a Violin (detail), 1918. Sheetlet with 4 values (4v M/S) (66.00MT) - Interior in Yellow and Blue (detail), 1946. (66.00MT) - Mr Boileau, 1893. Mozambique 2015 Tribute to Henri de Toulouse-Lautrec - Mint Never Hinged (MNH). Sheetlet with 4 values (4v M/S) (66.00MT) - Moulin de la Galette, 1889. (Mozambique 2015 Berthe Morisot (1841-95) - Mint Never Hinged (MNH). (66.00MT) - Orsay Museum & Lucie Leon at the Piano (detail), 1892. Sheetlet with 4 values (4v M/S) 3) Select each item and 'Add to Basket'. (Sheet with 1 value (1v S/S): 350.00MT. ==================================================. 3) Select each item and 'Add to Basket'. (Mozambique 2015 Berthe Morisot (1841-95) - Mint Never Hinged (MNH). (175.00MT) - Eugene Manet on Isle of Wight (1875). Sheet with 1 value (1v S/S) 3) Select each item and 'Add to Basket'. (66.00MT) - Dora Maar with Cat (detail), 1941. (66.00MT) - Woman's Head (Dora Maar), c.1940 & The Dream (detail), 1932. Mozambique 2015 Tribute to Pablo Picasso (1881-1973) - Mint Never Hinged (MNH). Sheetlet with 4 values (4v M/S). ((175.00MT) - Jane Avril Dancing, 1893 & The Moulin Rouge (detail), 1892. Mozambique 2015 Tribute to Henri de Toulouse-Lautrec - Mint Never Hinged (MNH). Sheet with 1 value (1v S/S) 3) Select each item and 'Add to Basket'. (Mozambique 2015 Paul Cezanne (1839-1906) - Mint Never Hinged (MNH). Sheet with 1 value (1v S/S) (175.00MT) - Card Players, 1892. 3) Select each item and 'Add to Basket'. (Mozambique 2015 Tribute to Pablo Picasso (1881-1973) - Mint Never Hinged (MNH). (175.00MT) - Old Guitarist, 1903-4. Sheet with 1 value (1v S/S) 3) Select each item and 'Add to Basket'. (Mozambique 2015 Paul Gaugin (1848-1903) - Mint Never Hinged (MNH). (175.00MT) - Sacred Mountain, 1892. Sheet with 1 value (1v S/S) 3) Select each item and 'Add to Basket'. Mozambique 2015 Pierre-Auguste Renoir (1841-1919) - Mint Never Hinged (MNH). Sheet with 1 value (1v S/S) (175.00MT) - By the Water (Near the Lake), 1880. =================================================. ((66.00MT) - Jeanne Samary in a Low Necked Dress, 1877. Mozambique 2015 Pierre-Auguste Renoir (1841-1919) - Mint Never Hinged (MNH). Sheetlet with 4 values (4v M/S) 3) Select each item and 'Add to Basket'. Mozambique 2015 Paul Gaugin (1848-1903) - Mint Never Hinged (MNH). (66.00MT) - Self-Portrait with Halo and Snake (detail), 1889. Sheetlet with 4 values (4v M/S) (66.00MT) - Still Life with Onions, Beetroot and a Japanese Print (detail), 1889. ((175.00MT) - Virgin in Adoration before the Christ Child, c. 1615. Mozambique 2015 Peter Paul Rubens (1577-1640) - Mint Never Hinged (MNH). Sheet with 1 value (1v S/S) 3) Select each item and 'Add to Basket'. (Mozambique 2015 Peter Paul Rubens (1577-1640) - Mint Never Hinged (MNH). Sheetlet with 4 values (4v M/S) (66.00MT) - St George and the Dragon, 1605-7. 3) Select each item and 'Add to Basket'. Mosambik 2013, Pablo Picasso, Nr. Diese Kosten sind vom Käufer zu tragen. Nach §25a UstG (Sammlungsstücke und Antiquitäten/Sonderregelung). Souvenir Sheets Paintings mint never hinged. Zölle und Gebühren anfallen. Y/T N° 4300 A 4307 ET BF 488 - NEUF LUXE. MOZAMBIQUE - ART - PEINTRES IMPRESSIONNISTES. Y/T N° 4222 A 4227 ET BF 475 - NEUF LUXE. MOZAMBIQUE - ART - PEINTRES HOLLANDAIS. Nach §25a UstG (Sammlungsstücke und Antiquitäten/Sonderregelung). Mini Sheets Paintings mint never hinged. Zölle und Gebühren anfallen. Peintures de 2001 au Mozambique par ensemble de Pablo Picasso de feuille de 9 timbres imperfectif. & 2 Perf s/s. Country/Region of Manufacture Mozambique. Year of Issue 2001. Mozambique 2002 - Art, Tableaux, Painting - Paul Cézanne. En cas de contestation, le texte en français est prépondérant et en cas de litiges, seuls les tribunaux de Liège sont compétents. Prévenez nous de votre passage. : neuf sans charnière ( ) : regommé : avec charnière ou trace(s) O : Oblitéré. 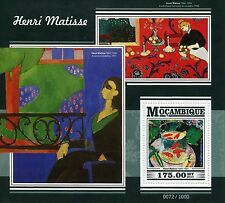 Peintures de 2001 du Mozambique par ensemble de Paul Gauguin de 2 feuilles de 9 timbres Perf. & imperfectif. Country/Region of Manufacture Mozambique. Year of Issue 2001. & Imperf.mnh. Mozambique 2002 peintures par Amadeo Modigliani 3 s/s Perf. & imperfectif. Type SET OF 3 S/S PERF. Country/Region of Manufacture Mozambique. Year of Issue 2002. Country/Region of Manufacture Mozambique. Year of Issue 2010. 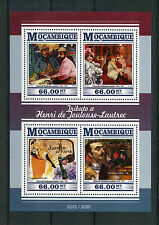 Mozambique 2001 tableaux de feuille de Amadeo Modigliani de 6 timbres & 2 Perf s/s. & imperfectif. Country/Region of Manufacture Mozambique. Year of Issue 2001. 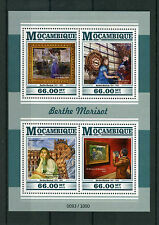 Mozambique 2002 peintures par Henri de Toulouse-Lautrec, Alfred Sisley & Marc Chagall 3 s/s Perf. Country/Region of Manufacture Mozambique. Year of Issue 2002. Type SET OF 3 S/S PERF. Mozambique 2002 Tableaux par Paul Gauguin 3 S/S Perf. & Imperfection MNH. Mozambique 2002 peintures de Paul Gauguin 3 s/s Perf. & imperfectif. Type 3 S/S PERF. Country/Region of Manufacture Mozambique. & Imperf.mnh. Mozambique 2002 peintures de Pablo Picasso 4 s/s Perf. Type SET OF 4 S/S PERF. Country/Region of Manufacture Mozambique. Year of Issue 2002. 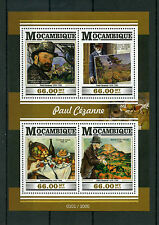 Mozambique 2001 tableaux de feuille de Paul Cezanne de 6 timbres & 2 Perf s/s. & imperfectif. Country/Region of Manufacture Mozambique. Year of Issue 2001. Mozambique 2002 Tableaux par Edgard Degas 5 S/S Perf. & Imperfection MNH. Mozambique 2002 peintures par Edgard Degas 5 s/s Perf. Type 5 S/S PERF. Country/Region of Manufacture Mozambique. Year of Issue 2002. Mozambique 2002 Tableaux par Vincent Van Gogh 6 S/S Perf. & Imperfection MNH. Mozambique 2002 peintures de van Gogh 6 s/s Perf de la Vincent. Type SET OF 6 S/S PERF. Country/Region of Manufacture Mozambique.